I recently upgraded my laptop to Windows 10. After the upgrade, I took necessary steps like installing new software and personalizing. But I do not know how to customize Windows 10 like a pro. I need to know what is with this start menu - how we can customize them? Also if you can, please explain me how to make the Windows 10 taskbar transparent? Actually the taskbar is transparent, but I need to add more transparency by adjusting the transparency. 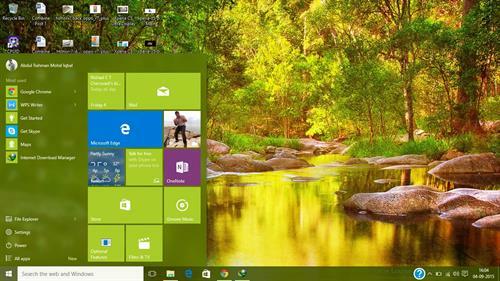 There are many ways to customize Windows 10. So it depends on what you want to do with desktop. If you are into shell and theme customization then software like Stardock windowblinds can help you make many changes. For example to make taskbar transparent, follow the steps below. 1. Go to start menu and click on settings app link. 2. Go to personalization section and select color. 3. Select "Make Start, taskbar, and action center transparent" option. That's it. You can now make it more transparent. Also do search for one small app that is floating on the net that can help you adjust opacity of each control on windows.